My childhood home back in Texas was one of those houses amongst my friends that we retreated to after many nights out. (And by nights out, I obviously and only mean awkwardly standing around our cars talking to guys in the Starbucks parking lot, wandering the grocery store in my mom’s giant poofy ballgowns from the 80’s, or wrapping/toilet papering someone’s house. Yes, I was super popular. Thanks for asking.) It wasn’t an especially grand home, but there was always a space for us to be there, no matter what else was going on, and there was always miraculously an endless supply of homemade treats mysteriously perched all over the kitchen. And the best part was, there was no unofficial barter that required us to hang out with my parents in return. (Though, being the late-blooming academic overachievers that we were, we actually did it anyway because nobody was gonna tell us that PaReNts~ArEnT~kEwL.) But there was something really special about coming home there as a student- both in high school and in college- with my friends…. Lucky me to have grown up in such a home. Fast-forward a decade (or... two? Who’s counting), a few kids and a transatlantic move later… I no longer have that house to bring my friends back to here in London. And to be honest, I hadn’t really realised how far removed we were from that perk of life until we visited the Isle of Wight last weekend. My sweet friend Ruth invited us to visit her parents’ house with their family…. in April. So we finally found a date that worked in November (which I say less to brag and more to expose how regretfully overbooked our lives are) to celebrate Bonfire Night with them. When we arrived, I immediately melted into that cosy feeling of HOME. Okay, not my home, obviously- but just a home that you’re really welcome in. (And okay, being a charming 17th century house in the countryside doesn’t really hurt.) 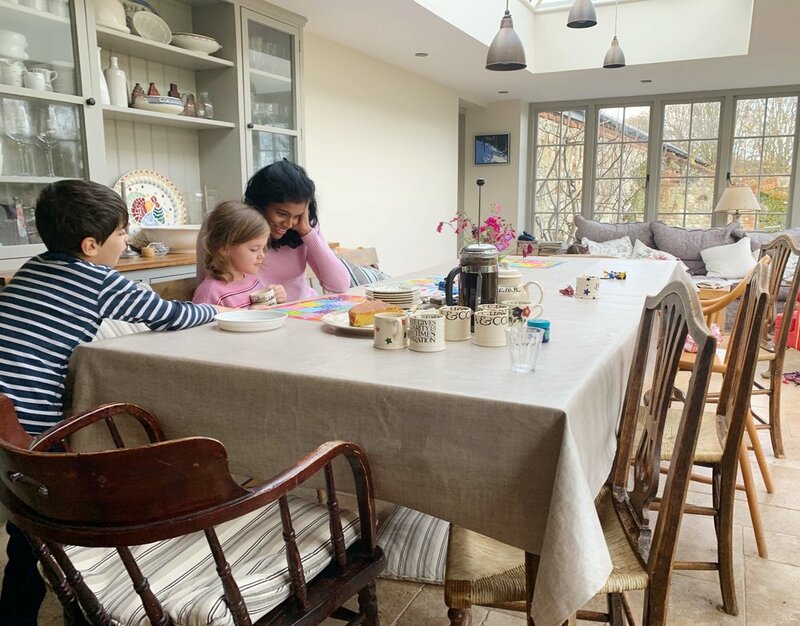 The kids got right to work playing in the garden and wandering around the playhouse under the apple trees, while the ladies got busy on the enormous homemade chocolate cake and a giant pot of Earl Grey tea that was awaiting us. Each bed had clean duvets and sheets puffed over the tops… and chocolates for us and wrapped presents for the kids. There were stacks of fresh towels, a baby monitor ready to use and baby gates that slid in and out of the wall to keep little ones from tumbling down steep stairs. We spent the weekend living as if we were family. (Thanks to friends that treat you as warmly.) Our kids played great together, the adults stayed up late by the fire drinking tea and chatting about any random thought that are brains come come up with after big days and enormous homemade dinners. Breakfast was warm breads from the Aga and a rainbow of homemade jam jars filled with treasure from past seasons in the garden. On Saturday, we headed out to the blustery Compton Bay, where we found a surfing competition in full-swing. The waves were crazy from the weather, but a crowd of RVs with friends and family perched out the backs turned it from ordinary to extraordinary. The scene was complete with kids with wellies on and giant mugs of tea cheering on their dads below, judges chatting and laughing in their chairs as dogs climbed in and out of their laps, and friendly locals coming up to chat about our kids and where we were from. (Definitely not in London anymore…) My kids just stared off at the surfers below in the awe of the unordinary. What may have felt as normal as anything to everyone else there, felt exotic to us. For lunch, we ate at The Cow. Like its name implies, the restaurant feels like a bit of a roadhouse and makes great burgers and beef dishes- like beef stew. (There are also veggie options, too. Actually, there’s just a lot to choose from!) I’d recommend doing the Burger Sharing Platter- where you get three of their smaller sized burgers and two sides. We shared between three people. In anticipation of a slice of chocolate cake back at the house when we returned, it was the perfect amount of food. We didn’t stay around for it, but there is a massive indoor/outdoor kids play centre. It’s got soft-play, giant jumping areas, and anything else that you need to occupy your kids and wear them out enough to fall straight asleep at bedtime. The next morning, after breakfast (warm, pain aux raisons from the oven, if you please) we headed to church in Ryde at St. James where they were having a special service for the 100th anniversary to the end of World War One. The church was really sweet and they were fabulous with the kids. (Viola walked out of Bible class with her own artistic rendering of a Leviathan, after they had talked about Job.) Afterwards, we had tea and custard creams in the church hall while we were chatted to by the regular members. The good thing abut going to the Isle of Wight from London is: it’s really an easy trip! Because our ferry wasn’t until 6 p.m., we had the whole day to linger over a homemade Sunday roast- complete with three roasted chickens, bacon-wrapped sausages, all the veggies… and a homemade cheesecake. The afternoon got drizzly, but that didn’t stop people from wandering out on a walk through the surrounding property, while others of us stayed back with babies, flicked through the endless cookbooks from the kitchen for recipes and ran loads of laundry with the main goal of getting to finish them off in their massive tumble dryer. Though you can book a stay in the part of the property that we stayed in- The Brew House. It’s all attached to the same property and is really cute and cosy. It has two bedrooms, and the second has two twins and a baby bed. (Dream scenario for us!) You’ll find books and toys and a kitchen with everything you need in it to really settle in for a few days. Not only can I not wait to come back someday, but it also ignited in me the desire to have a home that can be such a warm glow of hospitality someday. Places like that are such havens in my memory, and I’m so grateful for the people who not only open their homes to others… but do it so beautifully. LOOKING FOR MORE OF THE BEST WEEKEND TRIPS FROM LONDON? Check out my other posts here or browse my travel guide to England.